Directed by Michael Stern, son of the legendary violinist Isaac Stern, IRIS Orchestra is an elite ensemble comprised of some of the preeminent players from all corners of the country and abroad. The IRIS Orchestra concert series debuts Sept. 2 on WWFM The Classical Network. WEST WINDSOR – WWFM The Classical Network, located on the West Windsor Campus of Mercer County Community College (MCCC), is pleased to announce the launch of IRIS Wired, a new monthly concert broadcast series featuring performances by IRIS Orchestra, part of WWFM’s Celebrating Our Musical Community series. The program will debut on Friday, Sept. 2 and will air monthly on the first Friday of every month at 8 p.m. Led by its founding Artistic Director Michael Stern, son of the legendary violinist Isaac Stern, IRIS Orchestra is an elite ensemble comprised of some of the preeminent players from all corners of the country and abroad. 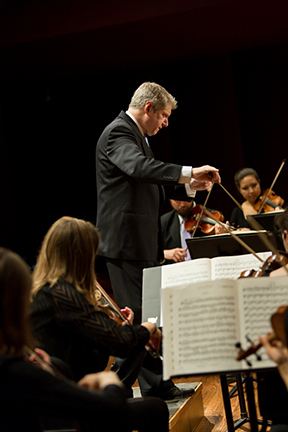 Since its inaugural concert in October 2000 with Yo-Yo Ma as soloist, IRIS has played an essential role throughout the Greater Memphis community, and continues to be dedicated to its mission of commissioning American composers, presenting thoughtful and interesting programming that blends the best of old and new, and serving the community through musical and educational outreach. IRIS strives to make music essential, transformative and accessible to all at the highest levels. The concerts are recorded live in the Duncan William Performance Hall of the Germantown Performing Arts Center in Germantown, Tenn. Maestro Stern is one of the world’s great conductors and currently is also Music Director of the Kansas City Symphony. The Celebrating Our Musical Community series features performances by ensembles and at venues throughout WWFM’s broadcast area, which includes Central and South Jersey, New York City, eastern Pennsylvania and Philadelphia, as well as from some of the major chamber and orchestral ensembles throughout the U.S. The concerts can be heard as Noontime Concerts throughout the week, and on Fridays at 8 pm. Other featured ensembles include the Princeton Symphony Orchestra, American Boychoir School, Chamber Music Society of Philadelphia, Concordia Chamber Players and the Bach Choir of Bethlehem. Celebrating Our Musical Community broadcasts are supported in part through a grant from the Edward T. Cone Foundation. The Classical Network, operating from the campus of Mercer County Community College in West Windsor, New Jersey, is a full-time classical music network serving New York City, New Jersey, Philadelphia, eastern Pennsylvania and portions of Delaware and Maryland, as well as reaching listeners in Colorado via satellite and around the world through streaming on wwfm.org. In the fall of 2008, the station launched JazzOn2, a 24-hour jazz station available on its HD channel 2 and JazzOn2.org. The station was the recipient of the 2014 ASCAP Foundation Deems Taylor/Virgil Thomson Radio Broadcast Award and has been named one of the Top College Radio Stations for the past two years by BestColleges.com. More information is available at (609) 587-8989, info@wwfm.org, or www.wwfm.org.